Triple Chocolate Brownies with a Secret Ingredient | I Wanna Bake! This past weekend saw a dear friend grow another year awesomer. In an effort to pay tribute to our shared interests and history, I decided I wanted to bake something with potatoes this week. (Because nothing says friendship like potatoes. :-P) Since this friend is also a great lover of chocolate, brownies seemed to be a natural choice. It turns out that potatoes and chocolate go great together in baked goods like cake and brownies. The potatoes add a nice amount of moisture, making for soft and fudgy brownies (I have yet to try cake, but I am optimistic on this front). Fear not! If you don’t tell people, they’ll never be able to tell these brownies have potatoes in them. 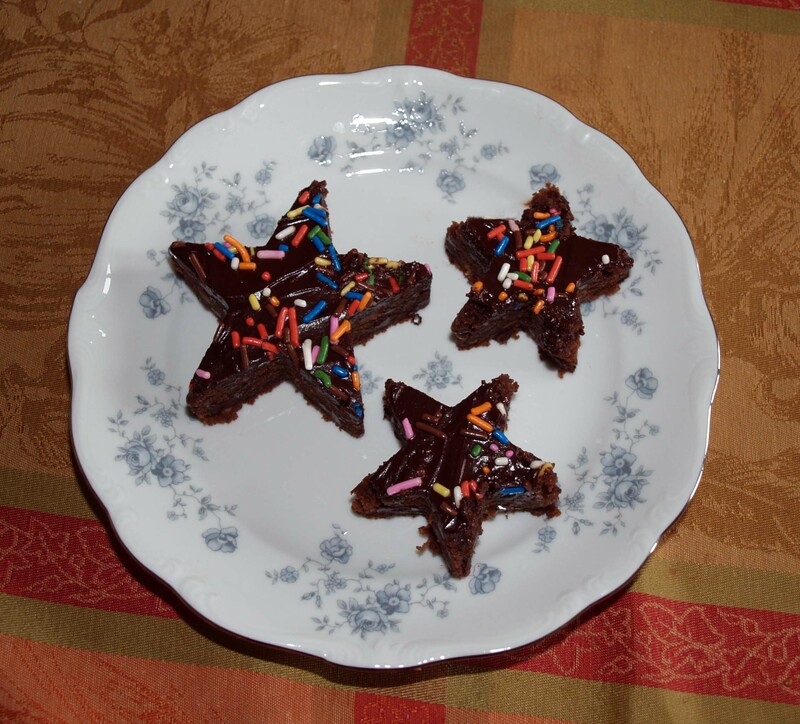 Can you still make delicious, fudgy brownies without mashed potatoes? Absolutely! Will you have as interesting of a conversation piece to bring to parties? I’ll let you be the judge of that. Your favorite musical soundtrack. I listened to the Original Broadway Cast Recording from Pippin because of its special sentimental significance for the aforementioned friend and me. This was our first school musical- she was on stage and I was in the pit. It was a great experience, and I remember it fondly. It’s also good background for when you’ve got magic to do. Ooooooh, it’s time to start bakin’! Peel and chop your potatoes and cover them with approximately 1″ of water in a medium saucepan. 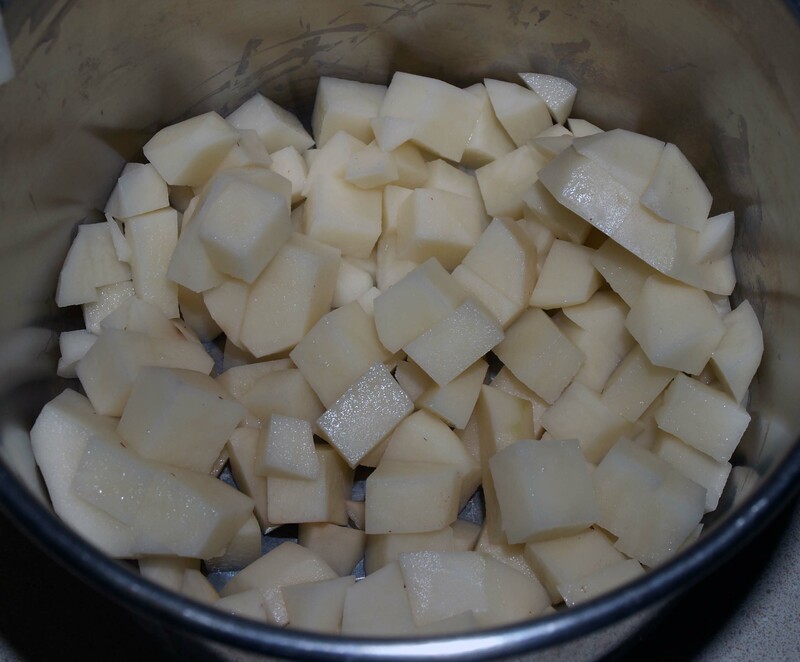 The size of your potato chunks is relatively unimportant, as you can just boil them longer if they are bigger. When the potatoes are tender, drain and mash them. 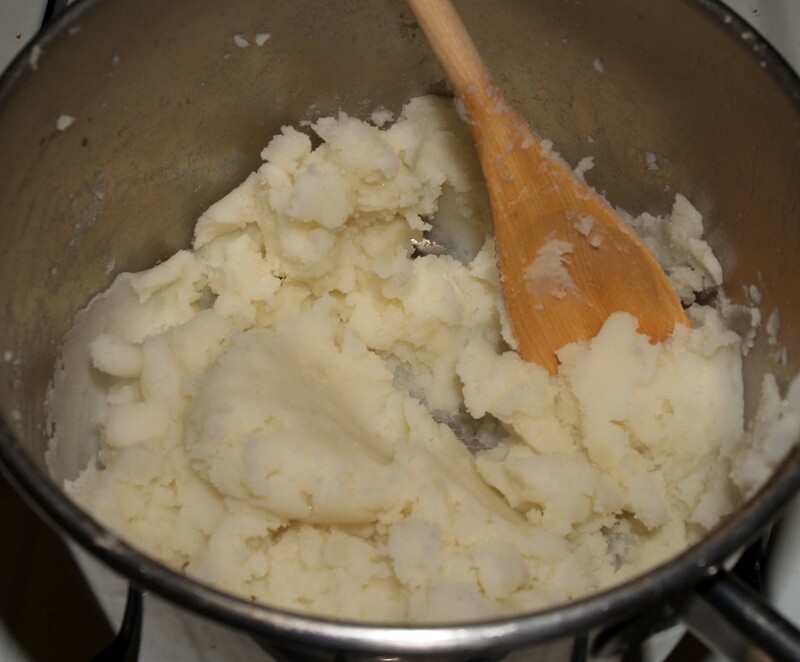 Do not add any of the usual ingredients you would use for mashed potatoes (milk, butter, etc). Set them aside to cool. 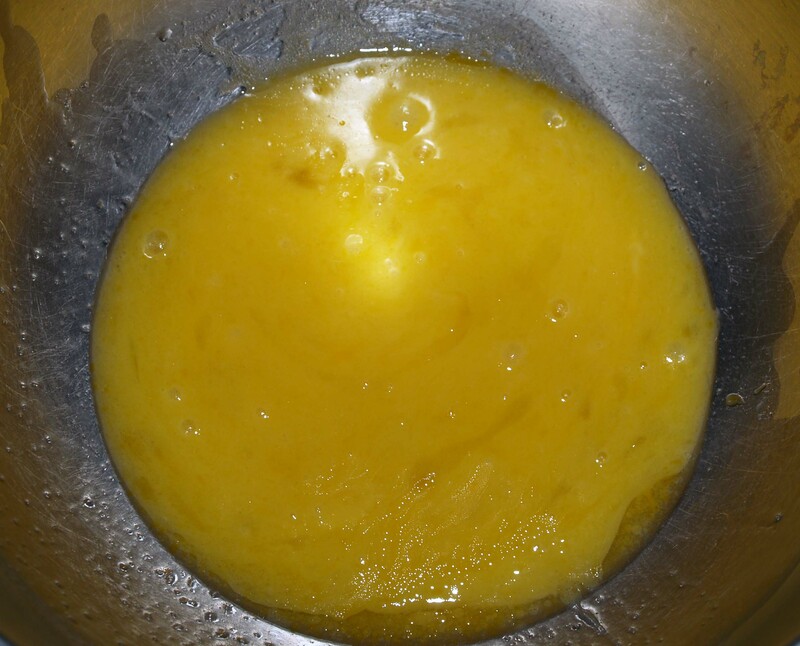 Put the eggs and oil in a medium mixing bowl and lightly beat them until they are mostly homogeneous, but not frothy. Add in the white and brown sugar, mashed potatoes, and vanilla extract. Beat on low speed until the ingredients are just combined. There will still be some small clumps of potato, but be sure to break up and larger blobs. 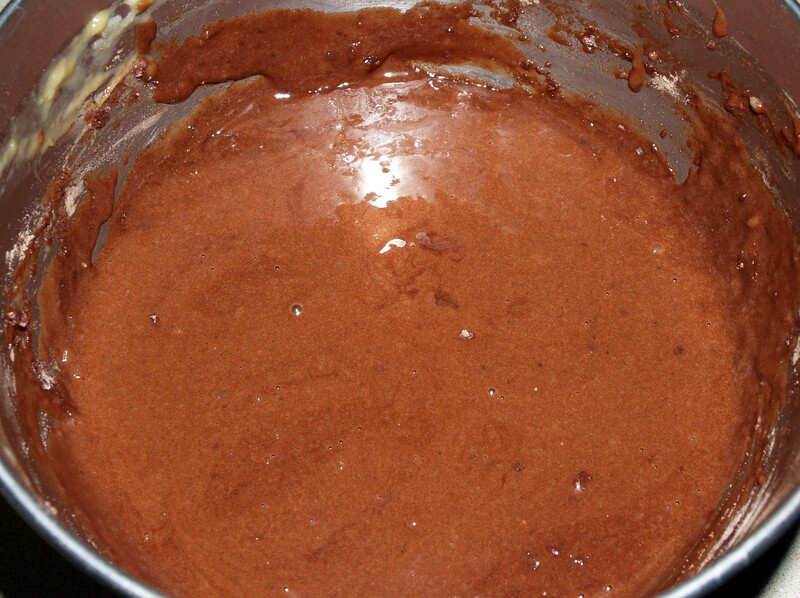 In a separate bowl, whisk together the flour, cocoa powder, baking powder, and salt. 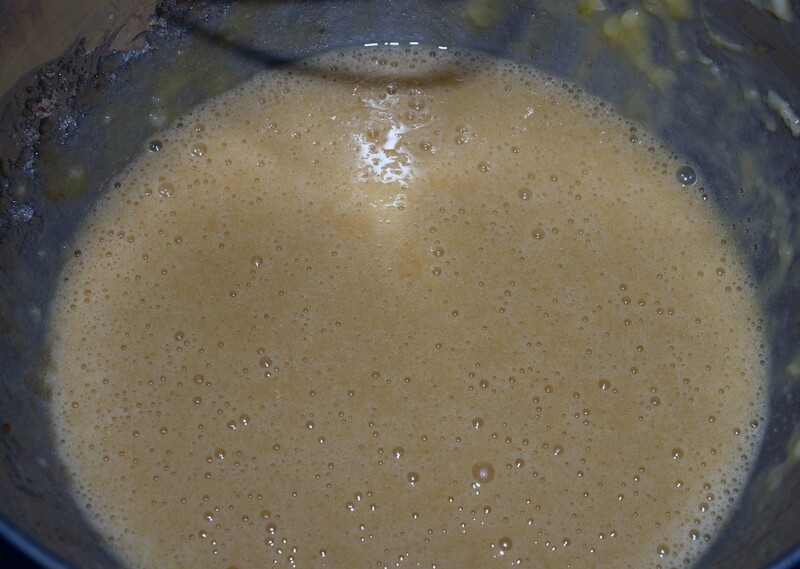 Add the dry ingredients to the wet ingredients and stir until the mixture is combined (again, there will be some small lumps). Stir in the chocolate chips. Pour the batter into a prepared 9″ square baking pan (I lined the bottom of mine with a square of parchment paper to make it easier to remove them). 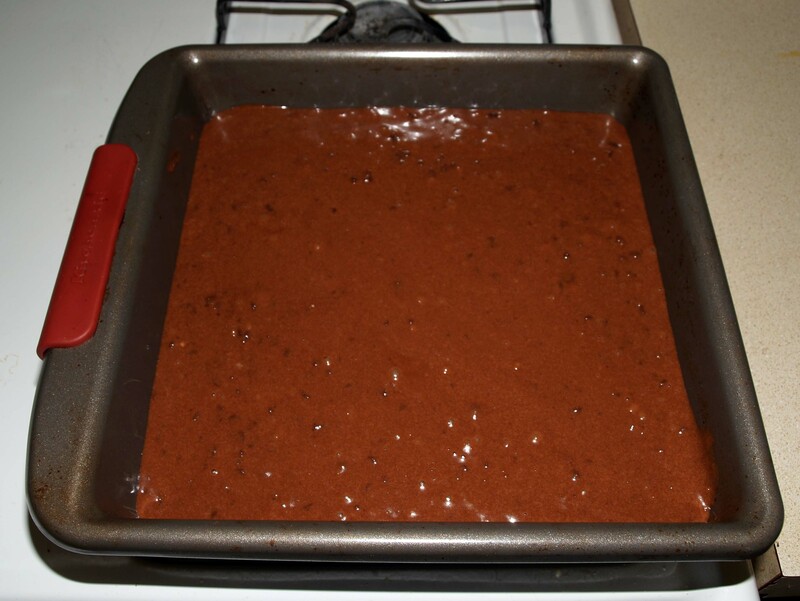 Bake your brownies for 20 minutes. Stick a toothpick in the center; if it comes out clean or slightly crumby (but not wet) they are done. If not, continue to bake, checking ever 3-5 minutes. You do not want to over-bake these because they will become tough. 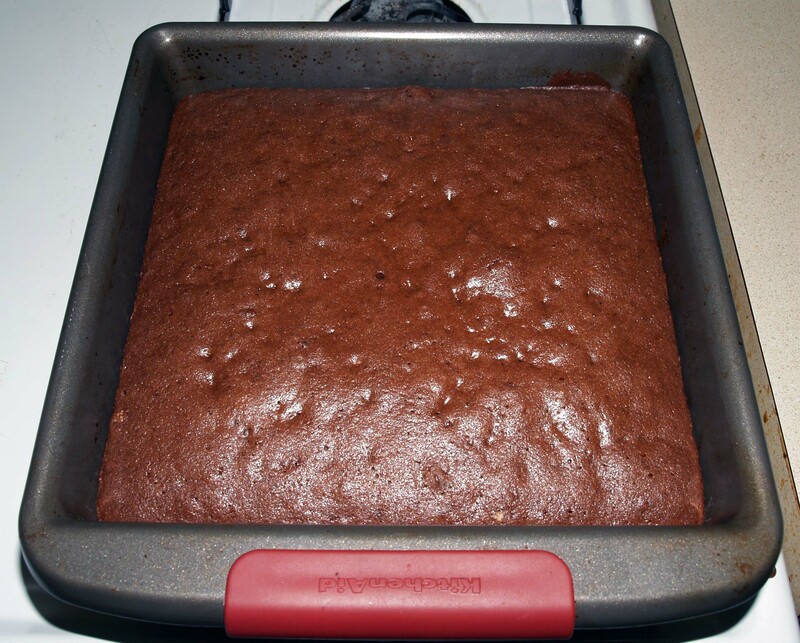 Let the brownies cool in the pan for 5 minutes. Run a knife around the edge of the pan to separate it. Place a cutting board or plate that is larger than the baking pan on top of the pan. 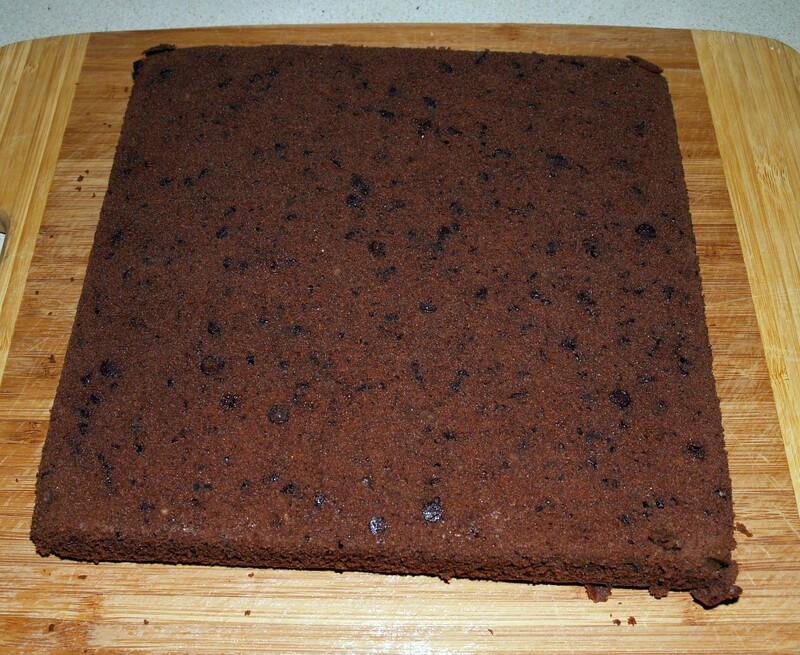 Quickly invert the pan onto the cutting board, being careful to hold the edges down so you don’t have a tragic brownie accident. Remove the pan from the brownie. Peel off the parchment paper if you used it. You can leave it upside down like this if you want, or you can flip it again onto another flat surface. 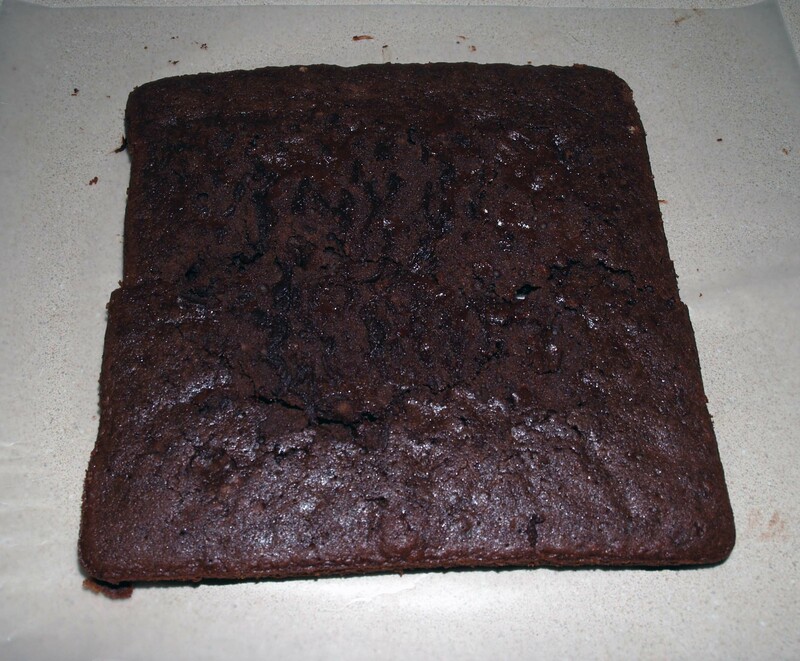 If you’re flipping again, be careful, because you can lose your brownie this way. 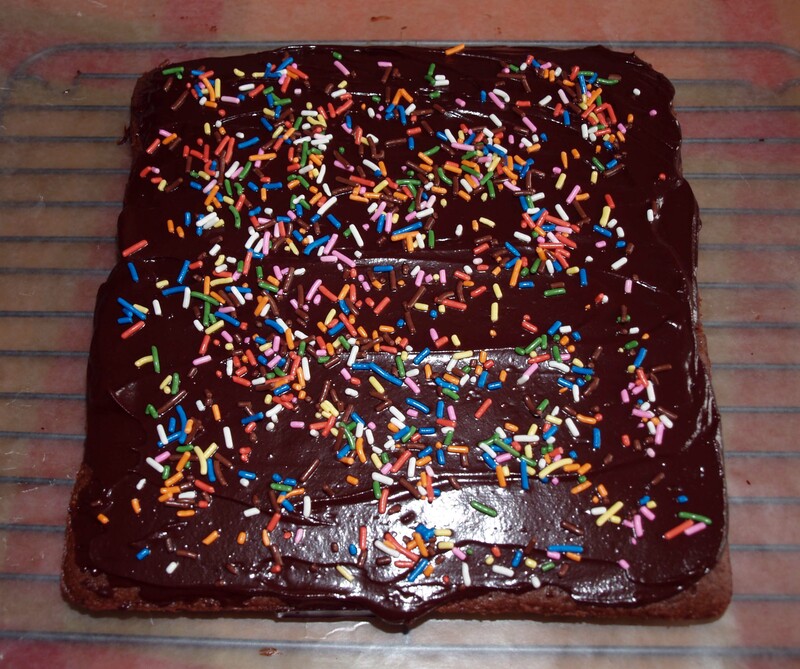 I would put a piece of waxed paper on top of the brownie, then put a cooling rack on top of that upside down. I will admit that I thought I could do it with just the waxed paper, and I was sorely mistaken. My brownie cracked in half and ended up all over the counter. I picked it up and shoved the two halves together, and it worked out ok.
Fortunately, we’re going to cover this in ganache, so you can hide your mistakes if they do happen. While your brownie is cooling (hopefully in one piece), chop your dark chocolate (if you’re not into dark chocolate, you can substitute milk or semi-sweet, or possibly white). Put it in a glass bowl or measuring cup. 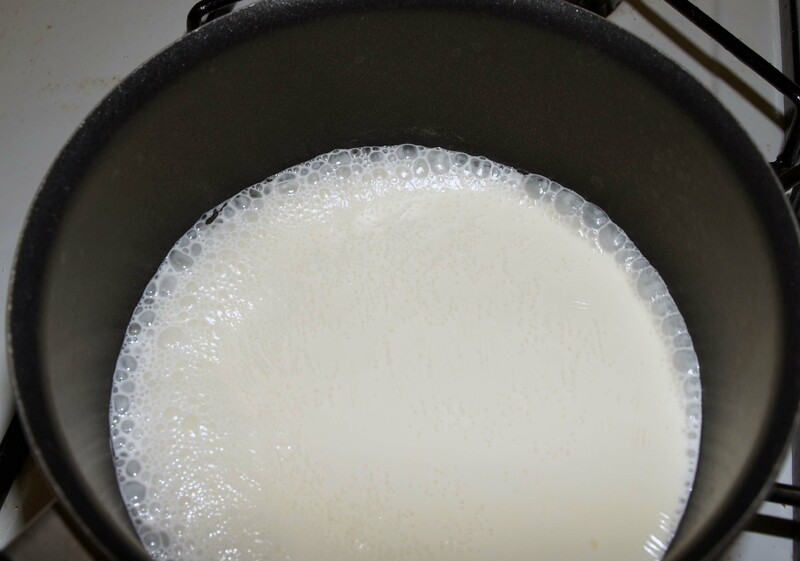 Put the heavy cream in a small saucepan and bring just to a boil over medium-low heat. When you see the edges start to bubble, remove the cream from the heat immediately. I would have liked to take mine off a few seconds sooner than you see here, but I had to get a photo for you. 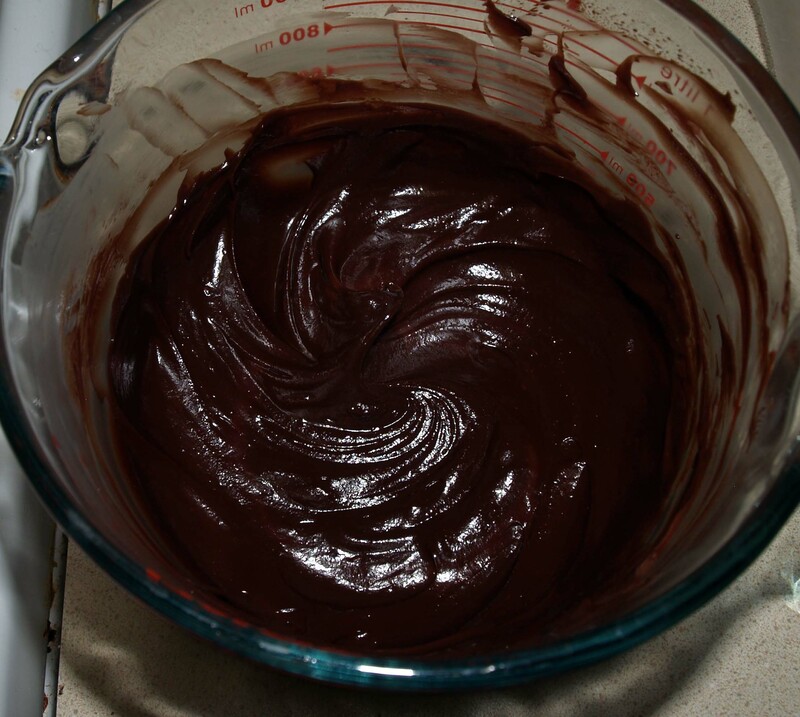 Pour the hot cream over the chopped chocolate and let it sit for 2 minutes. Gently whisk the cream and chocolate together, starting from the middle and working your way outward, until your ganache is smooth and creamy. Let it cool for 5 minutes, doing your best not to eat it all right now. 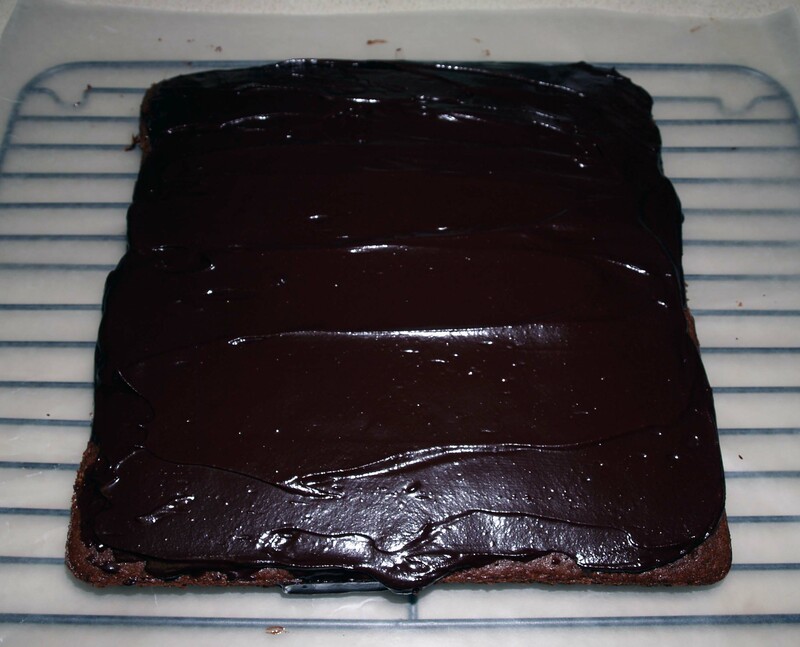 Spread the ganache over the brownie with a butter knife or rubber spatula, making it as smooth as you have patience for. Sprinkle the top with sprinkles, chopped nuts, or more mini chocolate chips if you still somehow believe there is not enough chocolate here. 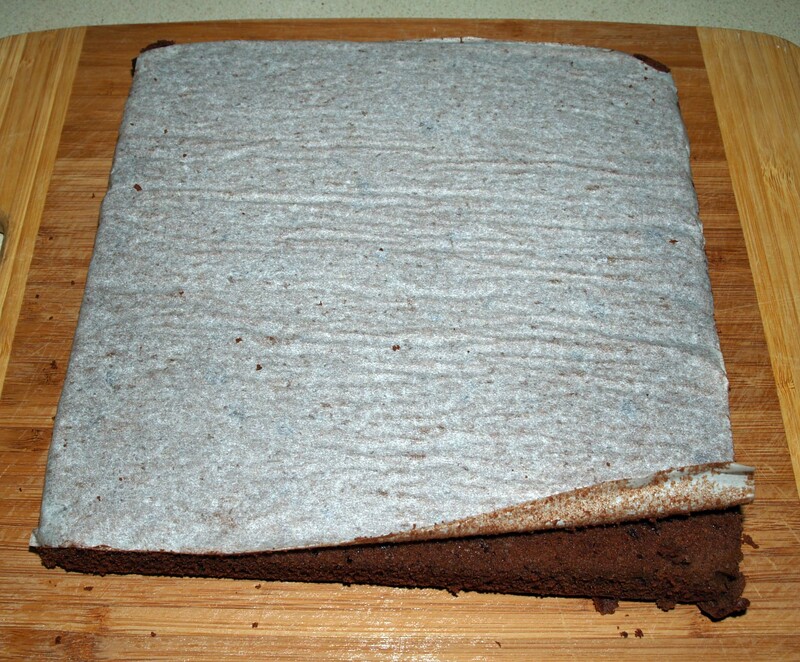 Let the brownie cool for another 20 minutes before you cut it. Slice into squares or use cookie cutters to make shapes. If you want to use cookie cutters, be forewarned that it is difficult to get these out of the cutter without messing up the top. I used a toothpick to carefully push it down around the edges, but if you come up with a better solution, let me know. Now enjoy the gooey, fudgey fruits of your labor! Pingback: Red Velvet Beet Brownies | I Wanna Bake!